This might just be the most elaborate way to open a bottle of beer. Pilots in China have used helicopters to open beer bottles mounted on poles, as part of a competition to showcase their control over the aircraft. The challenge demanded that they took the top off a bottle of beer fixed to a pole, without damaging it, using a bottle opener attached the the helicopter's skid. For the last event of the three-day China Helicopter Tournament, pilots had eight minutes to open a sequence of five beer bottles in a row, WWMT reported. The task required the pilots to hover smoothly near to the ground and move the helicopter by the tiniest of movements to open the bottles. A total of 40 points was awarded for each of the bottles that were opened and undamaged. 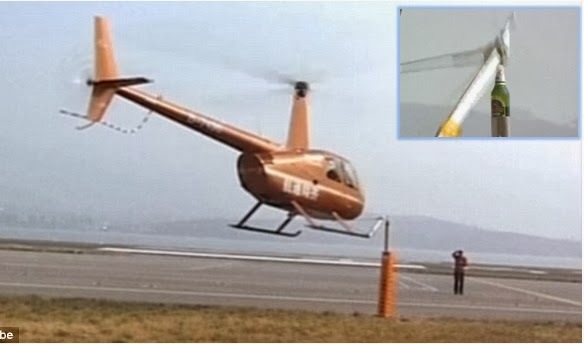 Pilot and competitor Wang Xuefei said: 'The game mainly tests pilot’s manipulation of the helicopter. 'We have to let the bottle opener get close to the beer bottle as much as possible,' THV11 reported. Unfortunately the pilot in the video failed in his pursuit of winning this year's title as it was decided that the bottle he opened was too badly damaged to qualify for any points. It appears that he took the glass rim off the bottle as well as the metal cap. However, the winner, Zhang Zhiqiang managed to open three of the five bottles in the required time and standard to scoop a total of 120 points, according to Jaunted. Falia Network 2016 © All Right reserved. Simple theme. Theme images by cmisje. Powered by Blogger.